I was briefly in Beijing last week, joining in a surreal but wonderful graduation celebration that the University of Bristol now holds regularly there: 370 Chinese students, 600 of their guests, 27 university staff, and 2.6 million hits on the event’s livestream channel. Earlier I had walked past the nearby entrance to the British embassy. That took me back to another China, the one that imploded during the Great Proletarian Cultural Revolution, and that produced some differently surreal moments in amongst the horror and the violence. 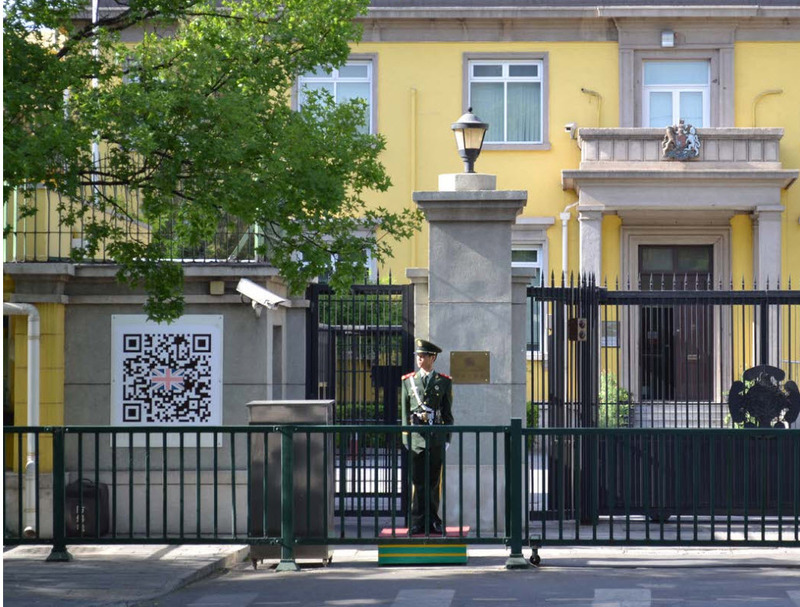 The entire British compound is surrounded now with high security fencing installed by those hosting the diplomats, and a plainclothes – and plain-speaking – Chinese security officer has now joined the soldier always on duty outside the gate. But it is still recognisably the building portrayed in a set of photographs I just received that were taken in the mid-1960s, although security was rather laxer then, and it was an unhealthy-looking pink in colour. These images below come from the politically heated summer of 1967. An insurgency against the British authorities in Hong Kong was by then well underway. In solidarity, and to protest against arrests of leftist journalists in the colony, the embassy walls and gates in Beijing were then decorated by protestors with anti-British posters and slogans: down with British imperialists; ditto the embassy (then, officially, the Office of the Chargé d’Affaires, as ambassadorial relations were not established until 1972); and ditto the then British Prime Minister Harold Wilson, and worse. This one below, printed in my new book, shows some rather different characters on duty outside in late June 1967 to those you can find today: US President Lyndon Johnson is slumped on the left, yoked to ‘running dog’ Moshe Dayan, Israeli army chief, who is yoked in turn to Harold Wilson. The white placards read ‘American Imperialist’ and ‘British Imperialist’ and are struck through in red: a sentence of death. These rather fine effigies appeared on 10 June in protest at alleged British and US support for Israel in the Six Day War. Behind them some more, made of straw, dangle from cables. These lingered for several weeks more until the night of 5 August 1967, when, tiring of this, and somewhat at a loose end –for all normal diplomatic business had ground to a halt because of the cultural revolution turmoil and the Hong Kong crisis — the British Head of Mission, Donald Hopson, authorised ‘Operation Effigy’. Hopson, a former commando, drew up a detailed plan for a ‘brief sortie into Chinese territory’ by two ‘assault groups’ to cut them down and bring the remnants into the mission. They had ‘finally become an irritation to myself and my staff’, he reported, deadpan, in a formal post-operation report to the British Foreign Minister. Under cover of a barbecue, and while the guests were ‘happily shaking and jerking on the dance-floor’, and when Chinese Red Guards were distracted by events celebrating the first anniversary of Mao Zedong’s land mark ‘Big Character Poster’ (or were busy trying to burn down the Indonesian Embassy), the two teams snuck out of the compound’s two gates, one atop a bus, and the other on foot. Ropes were cut and the loot was hauled back in, although one guard managed to salvage some of the remnants. Over in seconds, and reaching barely a few few feet into Chinese territory, it must surely nonetheless have been the last formal British offensive undertaken on Chinese soil. ‘I think it has done us all good to have a bit of a go’, reflected Hopson, after ‘sitting in the trenches for three months’. And if there had been any formal complaint from the Chinese Foreign Ministry, then he was ready to fling back at his hosts the phrase that had been hurled at them for months by then, that ‘the action of the British masses was entirely justified’. In the event, there was no complaint. And at this point in China’s history, there was not really much by way of a Foreign Ministry either. But two and a half weeks later, as tensions rose and rose, Red Guards stormed the compound and set fire to the building.